Digital automotive shopping, trading, searching, and researching channel Autotrader has launched new logo, brand identity and reworked advertising. The effort involved New York-based brand consulting and design firm Lippincott, which worked with the company and its agencies to replace the familiar AutoTrader.com logo with a new look featuring a sleeker name, a dropped “t” and an "AT" visual evoking auto badges, within a circular field evoking an ignition button. Pointedly, the new look is also intended to translate much more effectively to different screens. Even the signature orange palette has been altered to give it what Lippincott designer and partner Michelle Matthews says is a more salubrious tone. "The idea is a bright and optimistic journey. We wanted to clean it up and add precision." 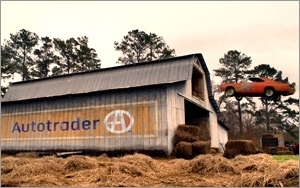 The brand revision broke Monday night with Autotrader's sponsorship of ABC’s “Dancing with the Stars,” with a rebranding of the company's "Dukes of Hazzard"-themed ad campaign, via Southfield, Mich.-based Doner. Kovac says a full digital campaign starts this week, tapping into social leveraging, targeting mobile, and outreach to consumers in the shopping process. New York-based global digital firm 360i is handling online components. Kovac says the effort includes grassroots takeovers in cities like Atlanta, Detroit, and Chicago with street art and building wraps playing off the interconnectivity of online versus off. The company also redesigned its Web site to make it more emotionally engaging, per Kovac. It sports a new landing page with a simplified visual field and alluring vista of the open road. The automaker added dealership reviews, streamlined the search experience, and made a number of updates to its mobile tools.